Fleas on cats raise emotions…When you hear someone talking about the issue, you often think of a flea-infested hairless moggie in some alleyway. But actually this is far from truth. Fleas on cats are the most common cause of allergy in felines, and a cat can have flea allergy dermatitis even is you cannot find a single flea on your cat. One flea bite is enough to cause severe itching and make the life pretty miserable to your feline. The word dermatitis means inflammation of the skin, and this really is how flea allergy shows. The most common culprit is the Ctenocephalides felis, which is the most common cat flea. 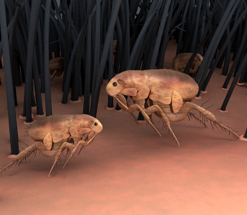 When a flea bites an animal, the proteins and enzymes in its saliva keep the host animal’s blood flowing and unclotted so the flea can keep on feeding. And it is this saliva some cats have a hypersensitivity to. There are fifteen known antigens in flea saliva- and unfortunately each of them are a possible cause for an allergic reaction. The flea saliva gets into the tissue around the flea bite, and mad scratching begins. Not all cats have hypersensitivity to flea bites. If a non-allergic cat is bitten by a flea, there is only minor irritation (like little bumps that don’t even itch). But those who do have it pretty miserable… Even one small flea bite may cause a severe reaction and two-three weeks of itching. The flea allergy dermatitis tends to begin when the cat is between three and five years old. Also this allergy tends to get worse with age. There may be a connection between a cat already having an environmental allergy and developing a flea allergy, as cats with environmental allergies seem to develop a flea allergy with more likelihood than other cats. The allergy symptoms of fleas on cats are obvious. 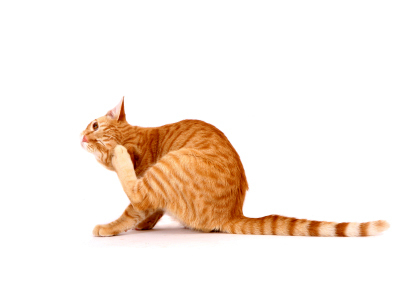 The itching is so severe the cat can literally scratch and chew its fur off, even to the extent of self-mutilation. The worst places are the base of the tail (on the rump) and back of thighs, and head and neck. As the cat’s tongue is very abrasive, excessive grooming can cause scabs and even open sores on its skin. These scabs are called military lesions because they look like millet seeds. The skin is red, swollen and irritated (the red color is caused by papules which are small red skin lesions). The excessive grooming with which the cat tries to ease its itching may lead to skin infections when bacteria gets into these sores. This condition is called the acute moist dermatitis or hot spots – a very painful condition. Yeast infections may also occur. 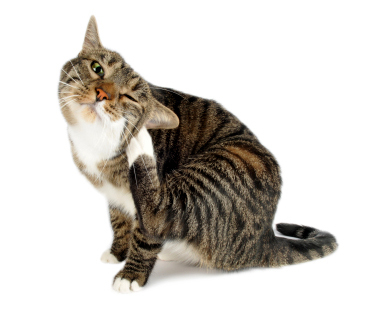 Symptoms of fleas on cats are considered seasonal – the flea season being the time when it is warm outside. That basically means spring, summer and fall. Of course in this day and age those fleas that get indoors can survive the winter, even if not in such high numbers. Still the seasonal changes can be seen indoors as well – when the warmer weather comes, the flea allergy symptoms worsen with indoor cats as well. If you suspect flea allergy, search for signs of flea dirt – small black flecks of the skin. Comb these flecks into a while sheet or paper. Then moisten the flecks with water and smudge (preferably with a cloth). If the smudge turns red, you are dealing with flea dirt. You see this dirt is flea feces, and that consists of the blood the flea digested from your cat. Still, it may be you find no trace of a flea, even though your cat obviously has a bad itch. This is because the cat’s excessive grooming has cleaned most of the fleas away. Also the cat flea allergy symptoms can be all over the body, so you don’t have an X to point the spot of the flea, so to speak. So many cat owners won’t at first believe it could be a case of fleas. It is important to get rid of the fleas on cats because they can pass other illnesses to your cat – and to you. Fleas can carry Lyme’s disease and hop into the cat’s owner, infecting them. Tapeworms are another common thing a flea can infect your cat with. Fleas feed on tapeworm eggs, which can be found in pet feces. A cat may come in contact with fleas that come from a cat that has tapeworms. Then, when grooming fleas off its body, the cat can ingest a flea that has eaten tapeworm eggs. And so, once ingested, these eggs can develop into adult tapeworms inside the cat’s body – the perfect host for a tapeworm, actually. It is a rare, but possible thing for fleas on cats to infect the feline with plague. As we all remember from our history classes, it was the fleas in rats that caused the famous black death of the Middle Ages. So a flea that changes host from a rat to a cat can carry the plague. Thankfully, medication can handle this condition easily, if it is caught in its early stages. Outdoor cats have a much higher risk of catching fleas than the indoor cats. But indoor cats can get fleas without ever stepping out – these little insects can come inside a house in a dog, or even your own clothes. But a cat owner should be on alert for fleas on cats, especially if it is a case of kittens. Kittens can actually die of fleas – these insects can literally drain their blood. So immediate action is required if you suspect fleas on your kitten – you don’t want to give the fleas the chance to multiply. Kittens are too young for commercial flea treatment as these can be toxic to them. Borax powder, baby shampoo and a flea comb are the remedy for the situation. And even in adult cats a serious flea infestation can lower the cat’s red blood cell count to the stage of anemia. Treatment for flea allergy dermatitis is discussed here. The photographs are copyrighted by their photographers. Do not copy. about treating fleas on cats?